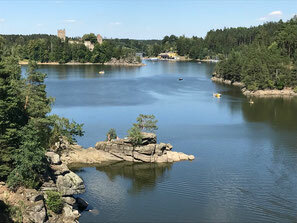 The natural paradise around the Ottensteiner Reservoir has been home to the 7km Open Water Classic for 13 years now. The race leads through fjord-like bays, who provide a unique natural scenery for the competition. For the first time, SwimRun competitions over 7.6 km, 22.2 km and 40 km are held, solo or team, therefore covering anything your heart desires. 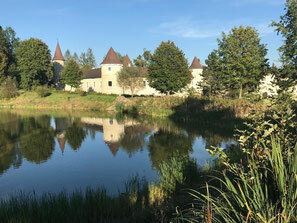 Waiting for you is a rich sightseeing program with castle Ottenstein, dam wall, ruins Lichtenfeld, castle Dobra, castle Waldreichs that you will pass during your alternating running and swimming sections (depending on the distance). The water is 20 degrees warm in July and offers ideal conditions for everyone. Come and let yourself be inspired by the unique environment, the fjord-like bays, the memorial fields of the Waldviertel Power Places. For our beginners! On the original route in the heart of the Olttensteiner Arena 7.6k are waiting to experience SwimRun. 4 runs and 3 swim parts create a variety and structure for an exciting entry into the SwimRun scene. Challenging and yet feasible - Individually and as a team, the 22.2 km around the Ottensteiner reservoir and its fjord-like bays can be mastered. The fjords of the Olttensteiner Stausee will be crossed several times. The ultimate challenge over 40 km. For team exclusive reserved. 7.8 km swimming and 32.2 km running are on the program. Passing castles, ruins, natural beauties and alternating trails, 810 meters of altitude are covered. Swimming and running is "IN". It makes sense. Running and swimming are classic sports and especially healthy, easy to exercise and to master by everyone. Even more exciting is the combination in the SwimRun as a new challenge and new opportunity to discover nature. The essence of SwimRun is following marked trails in nature individually or as a team of two, frequently changing between trail running and open water swimming. As a result, you run and swim in the same outfit- i.e. with neoprene and running shorts. 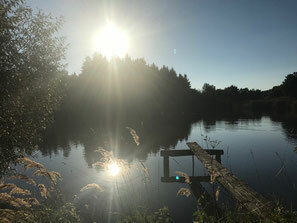 The special feature of the "ÖtillÖ movement" is that you originally mastered the track in a team of two, securing each other, motivating each other and finishing together.Today, there are various distances and even single starts are possible. This simple concept, originated in Sweden, has been in the last few years especially explosively developed by the ÖtillÖ World Series and Head as a supplier, is one of the fastest growing sports in the world. In Austria SwimRun finds more and more supporters and has already developed its own scene, which is additionally supported in the Cup Series. 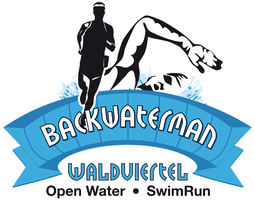 We are also part of the new Austrian SwimRun Major Series.